Now that I’m starting to spend time playing with packaging code for use I decided to dig into how access modifiers affect visibility of methods and classes inside of managed packages. public – Things that are marked as public are available for use by anything in the same namespace. global – Things marked as global are available for use by anything on the platform. Typically, public and private are enough for most implementations since your code resides inside the same namespace. When writing code to be used by others from your managed package you’ll want to make it global. In our class above we have several methods of different access levels as well as a class with constructors and methods of different visibility. With the first call of testPrint we can see that we have access all three inner methods. This is because the testPrint method belongs to the class and is allowed to call any private methods. Then we’ll see the other two calls that were made. For our class we have three different constructors that call from most visible to least visible. If we try to run the code above we’ll get an error because of the empty constructor is marked as private and we do not have access to it. The constructor for ic2 calls the private constructor and prints out the our debug message. The same occurs with the global constructor as it calls the public and private constructor. 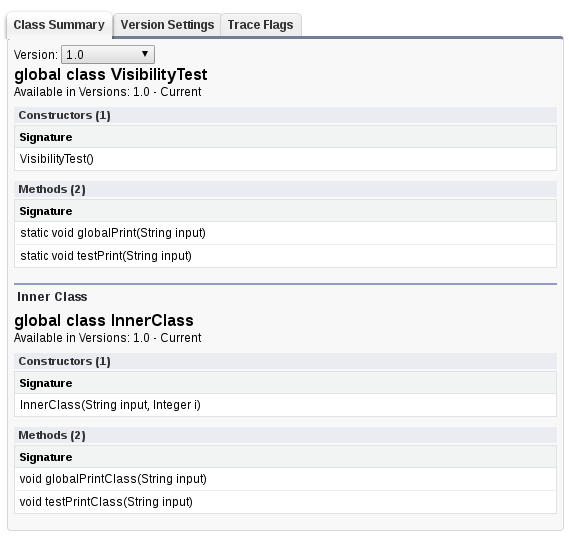 As with our static methods, any method inside of our class has access to the private method so testPrintClass is allowed to call the private method. Now that we’ve looked at the visibility of the code inside the same namespace, let’s package this code up and install it in another org. You can follow along by installing this package in your developer org. Thankfully the package provides a class summary to show which methods and constructors we have access to in our package. So let’s take look at the code that worked in our packaging org. We’ll first want append our namespace to our class name. This is because we are outside the namespace of the class so we’ll have to remove the public method call. After removing that our code works. NOTE: Because this is inside a managed package we cannot see the debug messages. As with the other examples, we cannot access the public method because we are not in the packages namespace. For most code that’s written, you don’t need to deal with global methods and variables. 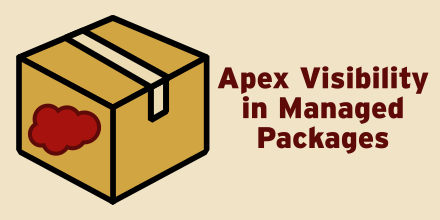 However when dealing with stuff that needs to be visible to consumers of your packages you’ll want to pay attention to your visibility settings. This entry was posted in Development, Salesforce and tagged apex, managed package, Salesforce. Bookmark the permalink.